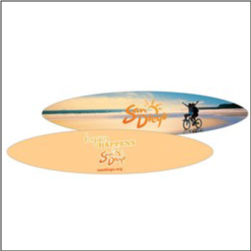 Order Custom Logo on Surfboard Two Sided Nail Files – a great fun promotional product for marketing a cosmetic business, spa, salon, wedding events, and more. These imprinted emery boards feature a picture logo that does not wear off, high visibility and long lasting, can come with mirror back and lint remover. Great for Travel related businesses as well. Made in USA.